Here are my unread and partially read books on the night stand. Some are recommendations from the kids. 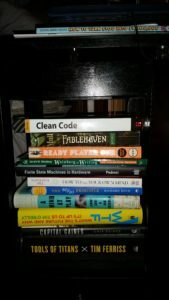 The Ready Player One, and Fablehaven are recommendations from my kids. Also, I can recommend the School for Good and Evil, also conisdered a young reader book, but really good and a fun read. I found it from the Tim Ferris interview with Soman Chainani, the author. I grabbed the book about Claude Shannon based on the recommendation from Embedded.fm. So far I have not had a chance to open it. At the very top of the pile, plugged in and charging is the Kindle. The problem with a Kindle, it hides a giant pile of books. Goodreads, if you don’t know is a site where you can keep lists of your books. The one you have read and want to read. I believe it is owned by Amazon now. They have a feature where you put in the genres that interest you, then they will send an email, based on your reading history and interests when books are on sale in the Kindle store. Every day I get an email with 8-12 $0.99 to $2.99 books. From my last post, you have probably figured I am a book junkie. It is like crack, and cheaper too. Now my Kindle is full of unread books. The list is long. One good thing, there have been some classic Sci-Fi titles on sale. I have read more fiction lately, and that is a good thing. One great feature on the Kindle store is the sample. If a book looks interesting, you can download a sample. After a few days/weeks, if it is not interesting enough to open before going to sleep, I would never read it, so dump it. Also, it helps me identify books that sound interesting, but are in business speak. To me business speak is the long winded, self important writing too many business books go into. Life is too short for that crap. On my Amazon Kindle page I have 244 books in the Kindle. That is after a massive purge of old samples just this morning. Anyhow, I will not bore you with a huge list, most of which I can’t recommend because I have not actually read the book yet. Today, I wanted to list some trends mostly to see if I can find any patterns. Science Fiction – I am a fan, but a lot of modern titles leave me cold. Somewhere I read a story about a young person, rejected by their group, an orphan, now on a epic quest to find the sword/jewel/secret dodad that will save themself, and their world. I just finished Rendezvous with Rama which was good, and The Martian was one of the best reads I’ve had in a while. So more classics than anything new. Business – I like a good one, and it is always nice to know what the next trend may be before the book of the month club blindsides you at work. I have to recommend, The Gervais Principle for a darker, funny take on corporate life. Startup – I just finished Unscripted, after a friend said it was good. I abandoned it 5% in. Maybe try the audiobook and it would be better. Technology – All kinds. Right now the Rust book is in the works. More on that below. Role Playing – I have a bunch of titles. Recently my oldest found my old AD&D books and we played once with his friends. I really enjoyed reading and thinking about role playing worlds. The hobby has progressed since I was a kid. Self Help and Psychology – Another recommended title, a new book from Napoleon Hill, and titles from Grechen Rubens, and Brene Brown. All good stuff. Other stuff – Of course there is a smattering of other things, plus books I bought for my wife. No, Amazon I don’t want any more Outlander books on my Kindle. Maybe you have heard of the Humble Bundle. They do a time limited sale with a pay what you want model. They sell games, mostly. Every few weeks they also have a book bundle. They will also send an email when something new comes out. I have scored books on Python, a whole set from Make Magazine, and even some cool role playing game titles. My last email temptation, Drive Thru RPG. I backed a Kickstarter for the Schlock Mercenary role playing game. The game is based on the web comic, so cool stuff. The digital downloads were provided by DriveThruRPG. Now I was on their email list, and I am a weak person. Every week they send out an email filled with ebooks of role-playing games. Many are previews of new games and free. Plus, I did not realize how much the web (yes, when I played it was before this Internet thing) has grown the hobby. You can get a short rules summary, some pre-generated characters and a introductory adventure all for free. I grabbed the Star Trek game preview, and a bundle of Traveller books on sale. Sweet! If you are a big old nerd like me, this post is costing you money. I will stop there. Just know, the world of books is wide open and there are many sources. Have fun and keep reading. ← What is on your Bookshelf?